The Chicago Cubs are quickly approaching an era where the young core of talented players is about to hit paydirt. It is the nature of the business that you play in the minor leagues to get seasoned, to make your game more complete before you earn your way to the top. It is understood that you will not make much money in salary in the minor leagues, just as when Kris Bryant was sent down in 2015, he made a pro-rated $82,700. Of course, by non-pro sports standards, that is good money, but since he banked $10.85M last year, the difference is stark. Bryant has entered the years where the power pendulum has swung his way. He has the hammer; once you hit three years of service, you get to arbitration, and now you can argue your value compared to your peers. Players who have the same service time, put up the same numbers, same position, age…these are some of the “comps” to know who you will use as a reference to justify your asking price. The teams want to go low, and the player wants to go high. And arbitration has no gray area. Decisions are final and they pick one side. When the Cubs sent Bryant down in 2015, they were making a long- term plan. By shorting him of that full season, they could have another year of control on the back-end (which led to a grievance filed by Team Bryant.) Theo Epstein was forthcoming about this standard strategy employed by teams. But Bryant is represented by Scott Boras, who will file that away (literally) and do what he can to claw back that year in earnings. This could be done by a patient approach, putting up numbers year-by-year and maxing your value in smaller increments. Or, dangling the idea that his client will leave as soon as possible. But this comes with risk. Injuries, bad years, anything can come up to make you wish you had the security blanket of a long-term contract. So you trade annualized max money for visibility and, let’s face it: at what Bryant will command, he will do well. Yet in major league baseball, value is about what someone is willing to pay and the market that defines that value. There is a difference between $200 million and $275 million, even if you can buy a small island with either. This is the economics of the game; balloon payments after paying your dues. You are represented by an agent who has institutional knowledge with a clear-eyed understanding of how short a career can be. Seize the day to get your value no matter what it says about your inflated place in society. Baseball creates wealth as a business and players get paid out of that pool. But it is a pool that swims in relativity, which is why Kris Bryant is looking at Machado and Harper to see when the first big domino falls. Let’s not dismiss who is representing Bryant in Boras. Someone with a long memory and the patience of a sloth. He will flood you with data, just as when he was recruiting me decades ago. Boras flew across the country to Philadelphia, dropped a nearly five-hour presentation on me which was complete with charts explaining why my signing bonus should be nearly three-times the standard. His argument was that I was an engineer at an Ivy-league school who will be losing all kinds of income while toiling away in the minor leagues. It was compelling, to say the least. But I ended up choosing Arn Tellem as my agent, a Philly-guy. Boras does not play games. He will push you to the brink. But the Cubs are not just dealing with Bryant and Boras, they are looking at arbitration eligible players in Schwarber, Hendricks and Baez, too — guys who will see some big pay hikes. Do you lock in these young players for a long time now or do you slowly work year to year, moving in and out chess pieces to adapt to an aging core of players? Who is your core? Most players, once they get to the pay day, reference the minor leagues to lose the guilt of getting paid seven or eight figures to play a game. My $327 paycheck when I played with the Geneva Cubs certainly was a motivator to work hard and a reminder to take the long-term deal on the table I would ultimately get from the Phillies in stride. Although Schwarber and Bryant had very brief minor league stints, they understand not to let youth blind you from how short your window is in baseball. Make your money. Their agents will remind them. I remember that crossover moment from my career when the Monopoly money started get thrown around in contract talks. It was after my first year with the Phillies, a full year after the Cubs traded me. I had a partial season and two full seasons under my belt. I was similarly situated to Willson Contreras, who is not quite at the three-year mark, but in a position where the Cubs would consider locking him up before his price tag goes up from a big season. It was surreal to see seven figure numbers thrown around remembering that a debate came up between my agent and the team over $50,000 or so dollars. A lot of money, but the discussion ended up framed as “Let’s not nickel and dime over it.” Really? Fifty grand is a nickel or a dime? That is the world that hits you literally overnight. In my case, since my parents always emphasized investing one’s money and planning ahead, I had to think back to the year when my dad had me write down the price of a mutual fund every day in a little black book to get used to tracking investments. I was very fortunate for that guidance. Good fortune also helps a player feel secure. My road was longer by today’s standards certainly, for a first-round college draft pick since it took me five years to arrive, but what mattered was appreciating the road that took me to Philadelphia as a starting player with a contract in hand that granted me three years of breathing room. I still needed to get better and adapt to the rhythm of 162-game marathons, while finally playing without the anxiety of being one play away from being out of the game and finding a new line of work. At least, that is how it felt. It also was validating to get this vote of confidence from a team. The naysayers, the setbacks, the years in winter ball, all could be reframed as a necessary part of the journey. It was an example of how you could truly change the past. My manager in Triple-A Iowa, who had my career buried for dead, would have been proven right if I somehow fizzled out after Triple-A. That would have been my story. I ran into a rough and tumble manager in the minor leagues who did not like me very much and I fell short. As a mentor of mine (and coach that brought me to Puerto Rico for winter ball), Tom Gamboa said “If you didn’t make it to the show, and your bubble gum card ended after Triple-A Iowa, you would have had good reasons, but you would have cheated on your destiny.” Destiny. Powerful word. This group of Cubs have one significant leg up on me in feeling established at a young age. They are world champions. They have defined destiny. Destiny looks ahead, but that long-term commitment also makes you look back in time. Many names came to mind for how I got to that point. Coaches, family, friends, mentors, heroes. I was taught by some amazing professionals. Sandy Alomar Sr., Jimmy Piersall, Tom Gamboa, countless teammates, like Shawon Dunston who passed on wisdom on a daily basis. I also remembered Jim Riggleman, my first manager in the big leagues with the Cubs. Riggleman would pull me aside and remind me that one day “You will be an everyday centerfielder. 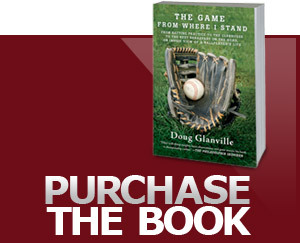 Maybe not here, but somewhere.” He would walk into the outfield during batting practice and plant the reminder. In a world of great talent all around us that fills up Major League Baseball, words mattered, words counted and these words came rushing back to me when I was about to sign a long-term contract with the Phillies that endorsed the belief that I was a big-league centerfielder. Kris Bryant, like any player on the cusp of a financial windfall, will think back on key words and those who helped him along the way. There is something clarifying about truly arriving and being able to look at your craft through a lens that can see past tomorrow. In 2015, when I was at ESPN, I interviewed Kyle Schwarber and Bryant at the same time in San Francisco (sadly I can’t find that tape), a day when Barry Bonds was hovering around the cage. I happened to talk to Bonds for a while at the cage and Bryant and Schwarber were in that wide eyed-stage. Open, optimistic, excited, new. They shared a lot about adjusting to the life; they were in the midst of that childhood joy. I recall learning that Bryant was a big Bonds fan growing up and was torn between admiring his greatness (as his childhood did cartwheels) and being frustrated with the PED allegations after Bryant learned firsthand what it took for him to make it honorably. Just fast-forward to today and Bryant is still a young man. But now he is a Rookie of the Year, an MVP, a World Champion, but he also went through a down year with injury, doubt, frustration and responsibility. The rollercoaster has begun. Bryant is reaching the heart of his career. The eye of the hurricane in baseball when a player is at peak performance. As the late-Ken Caminiti said to me one spring “Baseball is a great when it is going well. Nothing better.” So true. Not so fun when on the bench hitting .176 going into a Chicago late April night game. But with a long-term deal of the magnitude that Bryant will command, it helps that you are much more likely to have the time to get out of any slump. You are granted time in a long-term deal, but you are expected to produce more in that time. Fair enough. Yet you have to come to grips with the fast-acting maturity that must reach before your 30th birthday. You must be ready to peak at a young age compared to most other professions. The team has made a long-term investment in you. That investment needs to pay dividends and generate interest, now. There is no more future potential and upside. It is now-side. Get it done so we can win. Now the pressure really starts.